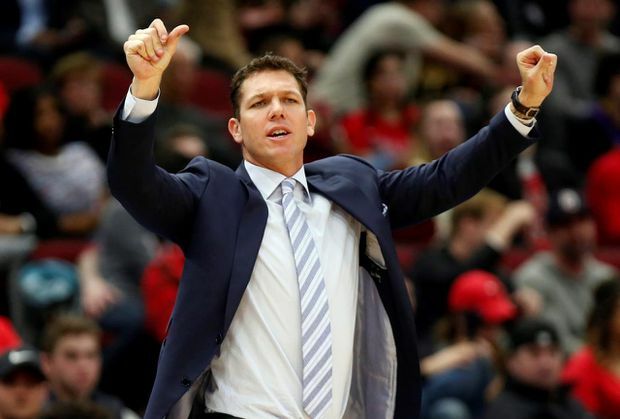 In this March 12, 2019, file photo, Los Angeles Lakers coach Luke Walton gestures to players during the second half of a game against the Chicago Bulls. About five minutes after hearing Luke Walton had been dismissed as coach of the Los Angeles Lakers, Sacramento Kings general manager Vlade Divac called Walton’s agent. Divac made that move because he felt Joerger wasn’t the right coach to take the Kings to the next level and the post-season and hopes that Walton can do that. He inherits an up-and-coming team in Sacramento that features several talented young players acquired by Divac: guards De’Aaron Fox and Buddy Hield, forward Marvin Bagley III and centre Willie Cauley-Stein. The Kings finished nine games out of a playoff spot after being tied for the Western Conference’s eighth seed heading into the final game before the All-Star break. Sacramento had its most wins since going 44-38 in 2005-06 during coach Rick Adelman’s final season. That ended a run of eight straight playoff berths and Sacramento hasn’t been back to the post-season since for the NBA’s longest active drought.